And just in time. I’m heading over to Caryn’s house today for a customizing day. 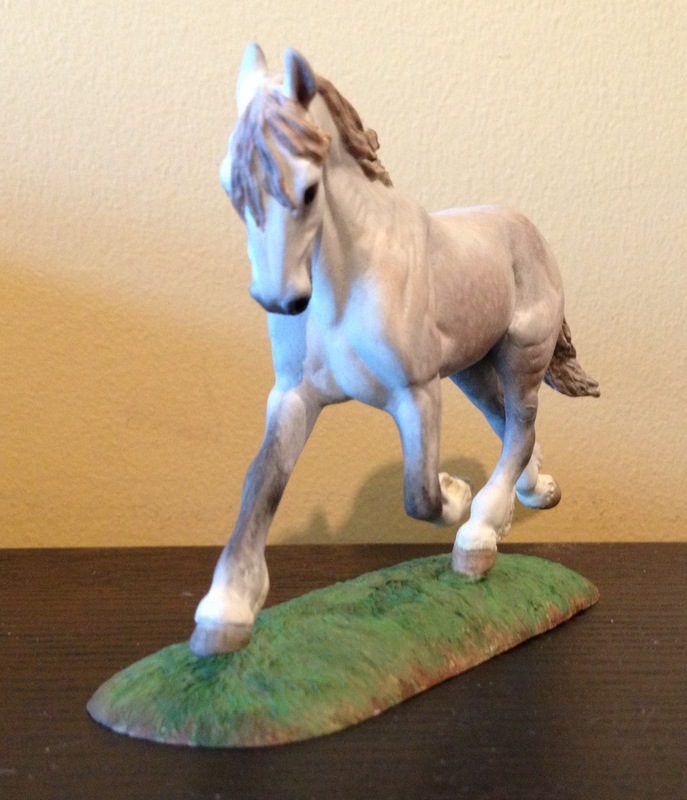 I’ll also be dropping off a horse I repaired for her and the newly finished Martouf. He’s going with her to the Swap & Shop Live Show while I’m in Hawaii later this month. Generally I’m not into proxy showing, since the best part of a live show is being there, but I’m really pleased with how Martouf came out and I’d be tickled to get him in the ring before, oh… September? That may be the next time I get to a live show. I finished Martouf up last night with a few last minute details, layers of matte coat, and then his final eye gloss. And I took some quite glamor shots, although they’re a bit washed out and don’t catch all the detail. 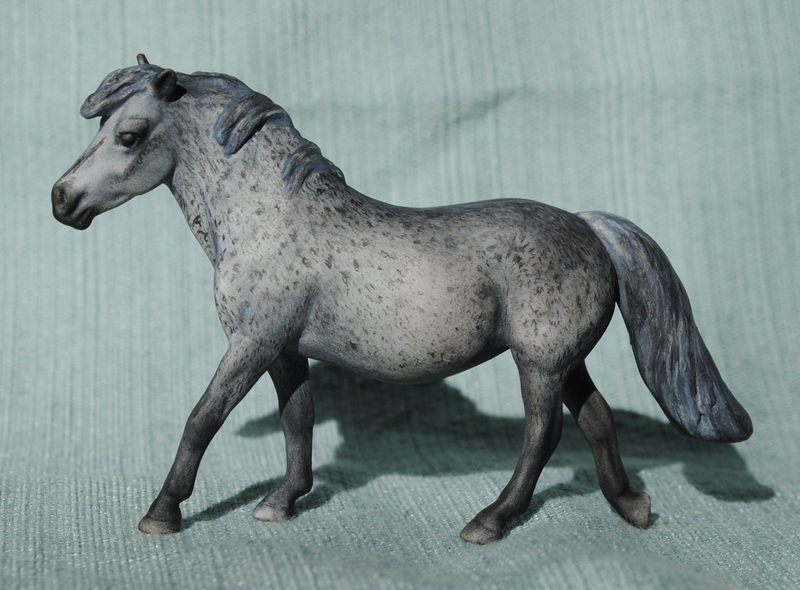 I’ll be adding him to my grey gallery page shortly, and I’ve made him a page in the Equine Resin Directory. I also added some updated pictures to my site’s other pages. I hope one of these days I can take the time to update my photo show photos- they really need some work, and I have a number of horses who don’t have a picture at all. Martouf’s rose gray color is a combination of pastels, acrylic hairing, and white charcoal pencil. His mane and tail are acrylics. Big thanks to Caryn for gifting me this lovely resin! One of the other projects I did this December was to paint my first medallion. I couldn’t post earlier because the recipient of the medallion reads my blog, but the gift’s been given, the horse is out of the bag, and I can post some pictures. It was quite fun to paint a medallion. It was simple in that it was a manageable size and only had one side, but with a lot of potential for wee detail as well. 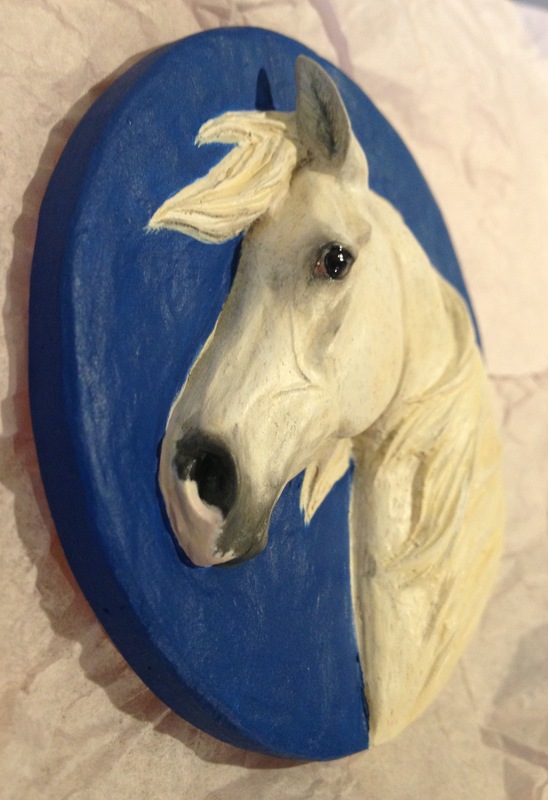 I think I spent half an evening painting the inside of the horse’s ear. I did more than usual in acrylics, too, which is always challenging and satisfying. 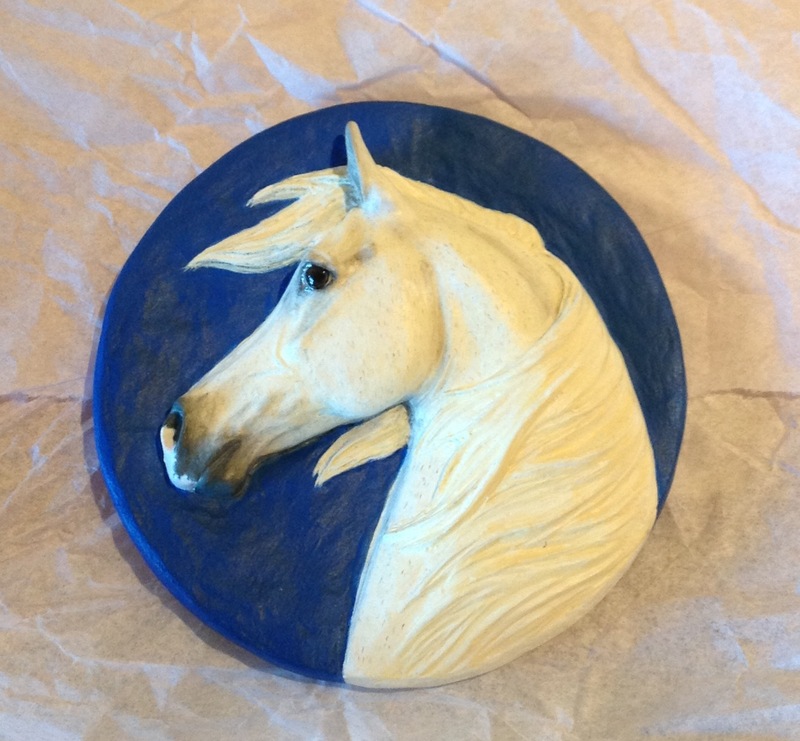 This medallion was sculpted by Sarah Minkiewicz-Bruenig, but I don’t know it’s name. I painted it as a portrait of my friends Arabian gelding. It was exciting to get to paint a traditional sized eye! There’s just so much room in there- like moving from a twin bed to a California king! It’s down to the wire getting Alpo’s new finish work done in time for the show tomorrow. One of the ways I sped up the process was by doing a lot of his color in acrylics. 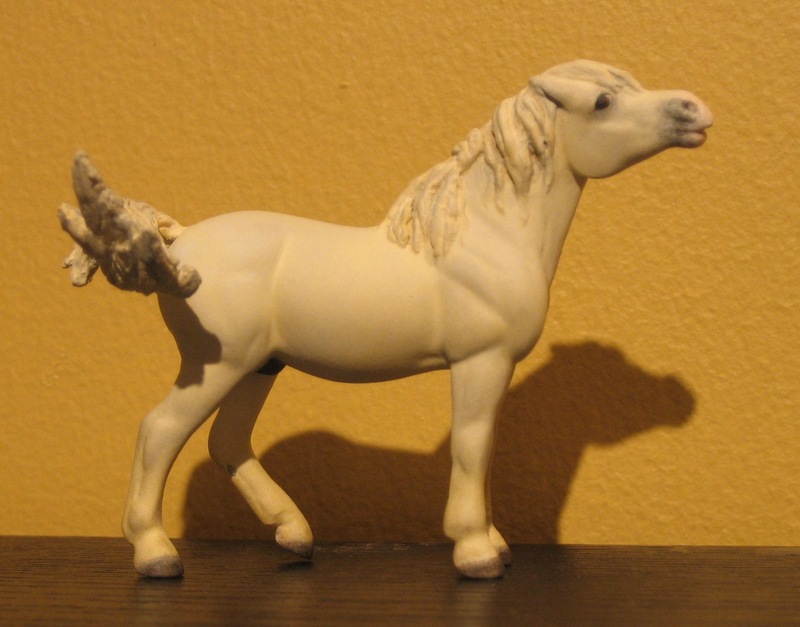 This also really helped with my other conundrum: how to keep this white horse clean! One of the things I find difficult about pastelling a “white” grey is keeping the horse from getting bits of darker stuff in his coat, whether it’s pastel or dust or what. It’s difficult, and something that’s never really been an issue on other colors. But since Alpo has an acrylic base coat, keeping him clean and doing little in-progress touch ups was relatively easy, since I knew what colors made up his base. Doing so much work in acrylics might not sound speedy, but what helps is that unlike with pastels, I don’t have to wait for fixative to dry for hours between coats. I can get a lot of color and detail in without stopping, so a couple hours in the afternoon goes a long way. By Thursday night Alpo was 98% done. Since then he’s gotten a few tiny nitpicks and several layers of fixative to seal everything in. My plan is to gloss his eyes tonight and pack him up last minute tomorrow morning before I hit the road. 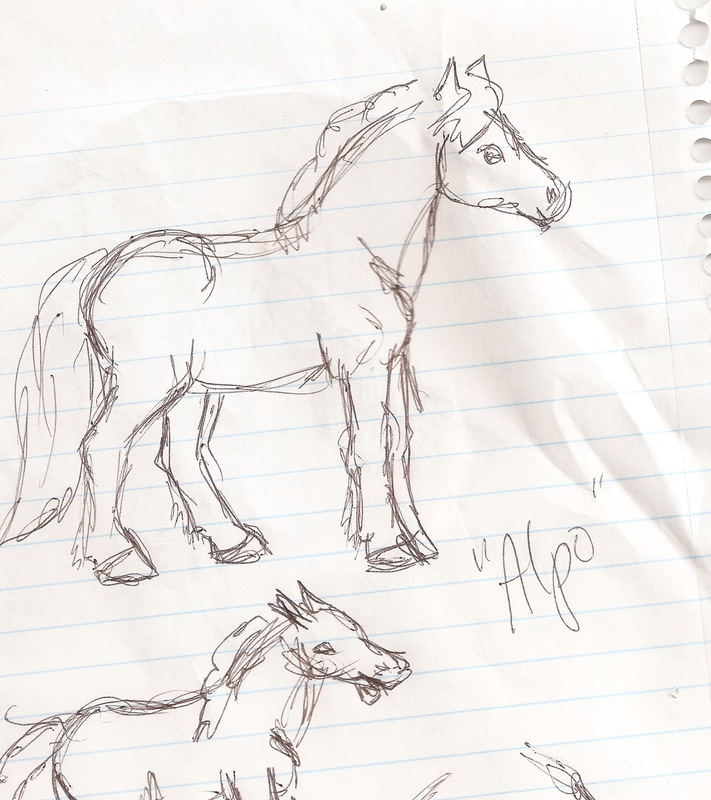 This iteration of Alpo is in general similar to his original self. His tail is a bit swishier and detailed, and he is a lighter, whiter grey color. I also did his muzzle coloring a bit differently, inspired by one of my favorite ponies, Markey (aka The Great White Sharkey). Alpo’s last coat of fixative is drying as we speak, and I’ve got my new gloss varnish out and waiting. My other ponies are all packed, reference sheets made, and I dare say I’m ready to show! As of today, Alpo is officially finished and sitting crankily on my shelf. Prophetically, around the time he was getting his final coats of sealer I ran across my original Alpo brainstorms which were tacked to the bulletin board in my old studio. I hadn’t realized how long ago I started him- but it was at least a year if I was still in the old apartment. He took his sweet time getting done. 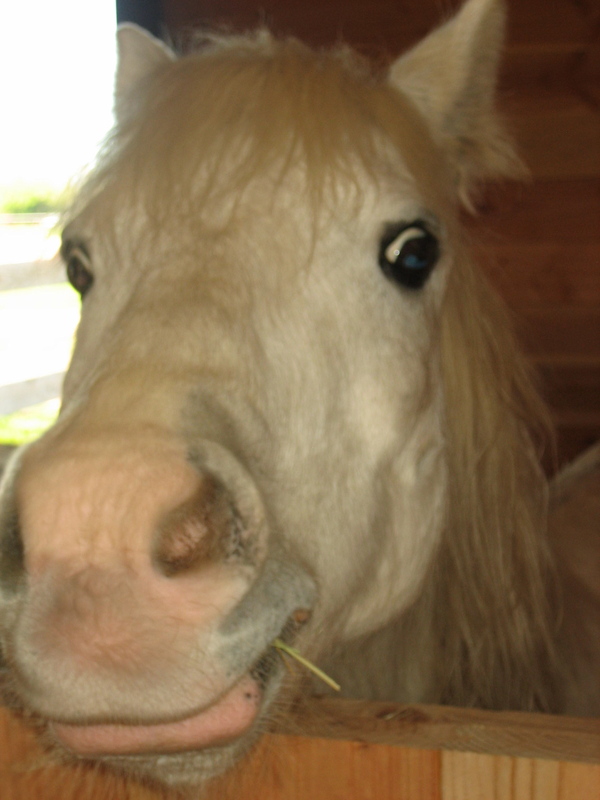 But then, he is a pony that does things his way. 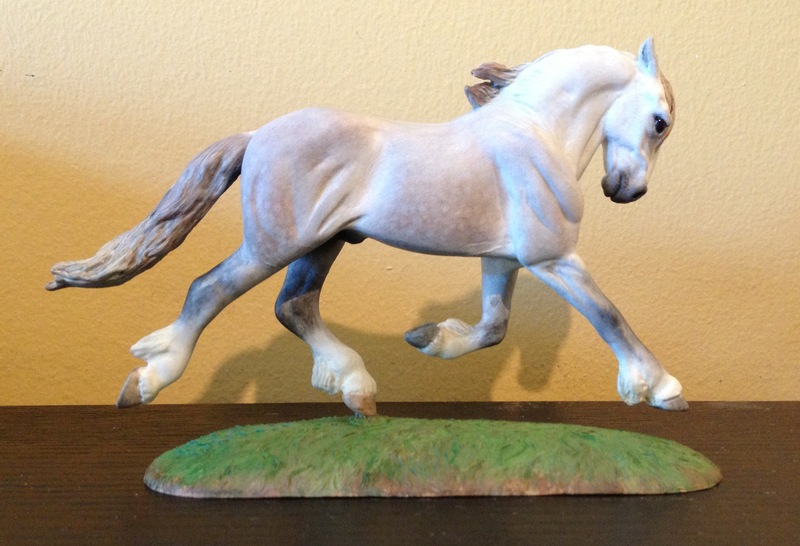 I’m very pleased with how he turned out, and it’s lovely to have him displayed in all his glory with the other finished horses. 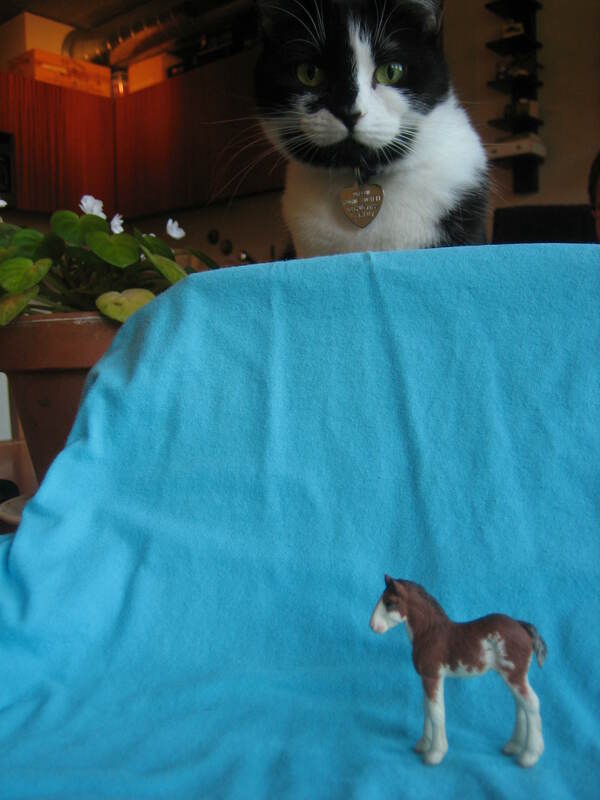 And of course, (if I can coax him into the trailer…) he’ll be attending next weekend’s show. I’ll post a few more pictures on the grey gallery page. Inspired by my lovely new collection display and a post about flea bites on Fallen Leaves, today’s post highlights two horses that are nearly finished and who have both been detailed using colored pencils. 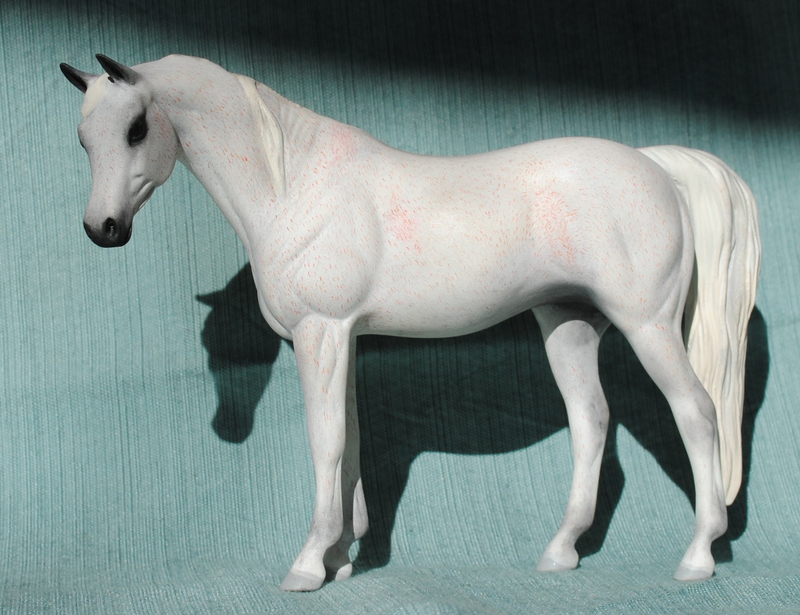 First is “Nettie Perle,” a Pebbles Arabian mare in flea bitten grey. I adore this mold and was very lucky to be able to trade for one, since they are pretty expensive even as bodies. After prepping and using white primer, I shaded her with white, grey, and black pastels. After those layers were sealed I did several layers of fine ticked flea bites using a Derwent colored pencil. I am very pleased with the results. 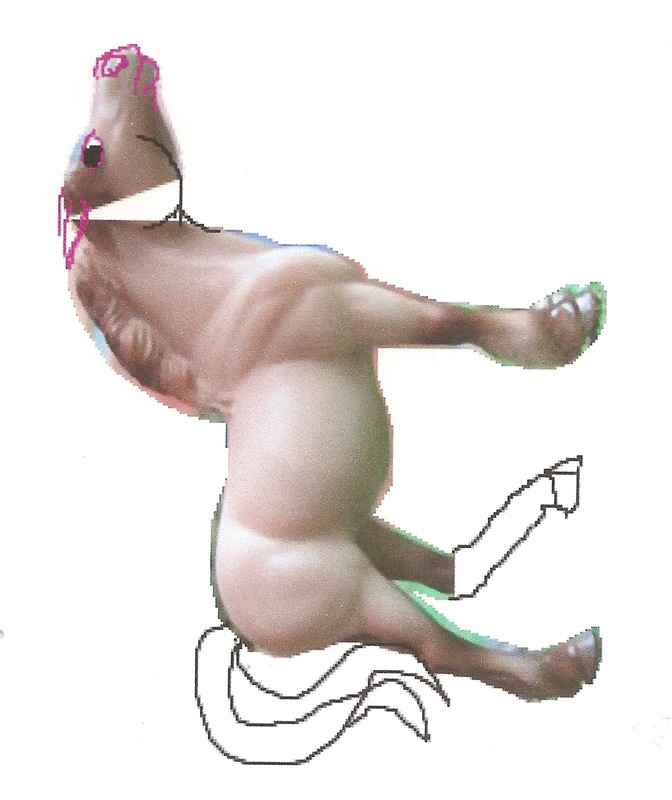 Now I just need to do facial details, hooves, chestnuts, etc. and she’ll be finished. 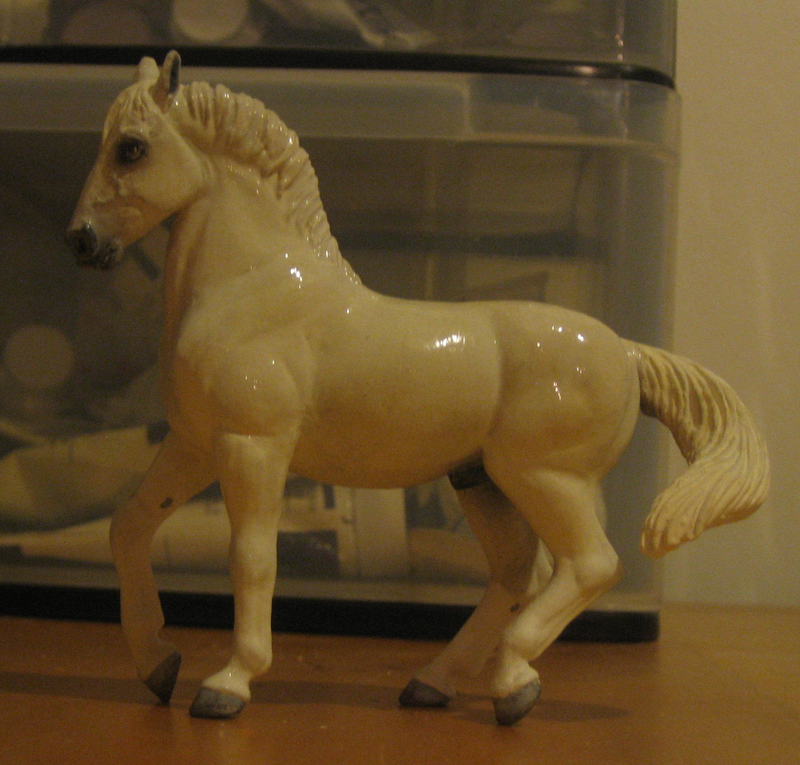 Horse number two is the Peter Stone Chips pony, another awesome and hard-to-find-cheap mold. I searched for one as she is the perfect portrait of a mare that long ago taught me to canter, Diamond. 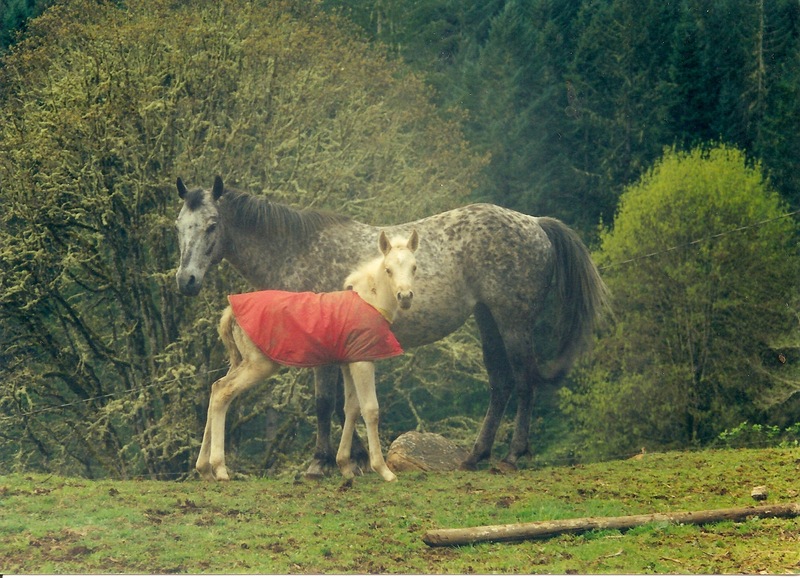 Diamond was a POA broodmare and summer camp horse with the most unusual coloring- her official color was blue roan with leopard spots. I actually had a custom done of her (on the Trad. 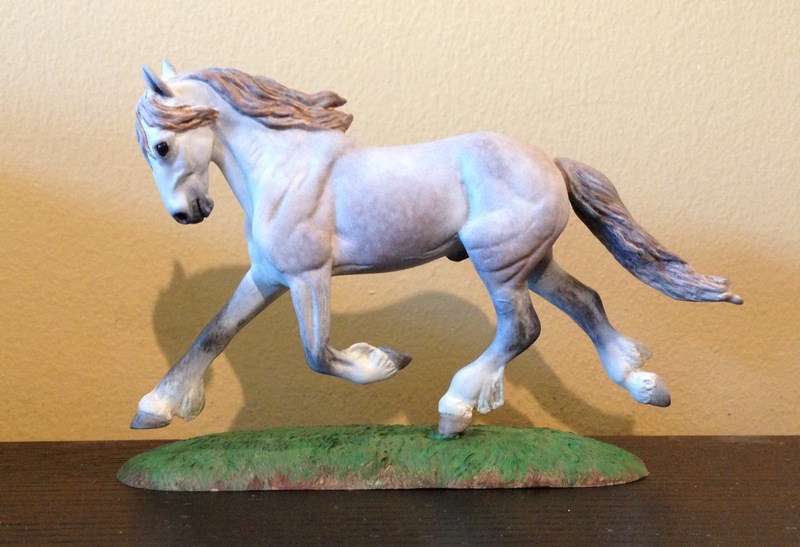 POA mold) when I collected horses as a kid, but I was never really happy with how she turned out. To create Diamond’s roaned and leopard coat, I used black and white pencils (both Derwents and pastel pencil) to make hair marks over a pastel base coat of her blue-grey-white coloring. I’ve done several layers of roaning in both black and white, including both hair marks and larger spots- you couldn’t really tell on her where roaning ended and appaloosa spots began, so that’s the look I’m going for. As with Nettie Perle, I’m very pleased with how this penciling technique has worked out. Diamond is also at the stage where she only really needs last details such as chestnuts, hooves, eyes, and face detailing to be done. Follow hair growth charts – a horse’s coat is full of interested whirls and curls and you want to make sure to capture this correctly with any hair detailing. I have posted hair growth charts in a gallery here. Go slowly – this is not something to rush! I like to watch TV while I work so that I am not overly focused on the pencil work but relaxed and methodical. 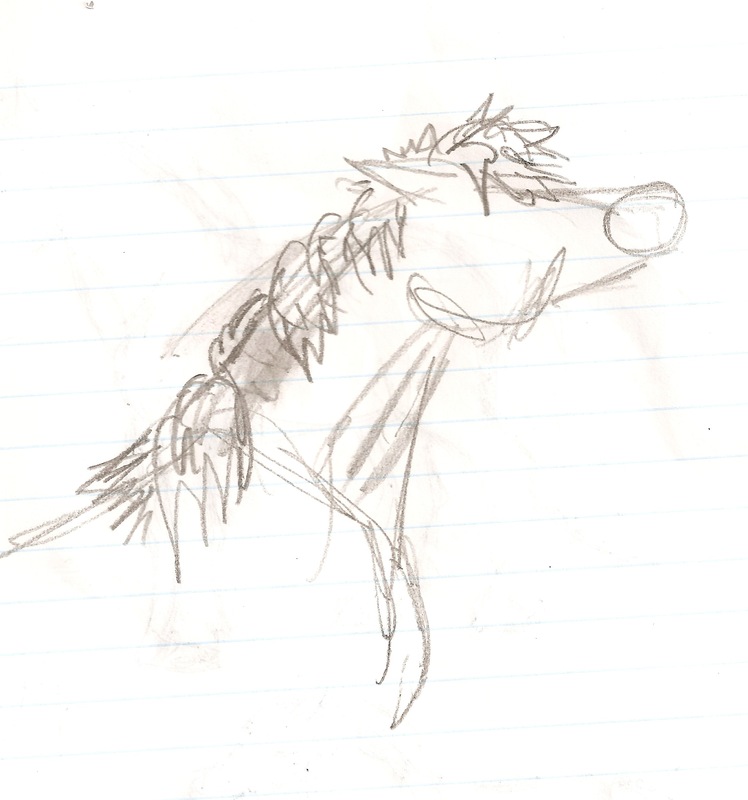 Seal between layers – the best effects are going to come from multiple layers of “hair” just like a real horse. Seal between layers to avoid messing up previous work. Sharpen the pencil often – no matter what scale you are working on, hairs are tiny! Keep a sharpener handy and don’t let your marks get too wide and blunt. Vary your strokes – for both roaning and flea bites, varying the number of “hairs” in different areas will create a more realistic pattern. You don’t want uniformity in the coat, just consistence. Especially with flea bites, the concentration of red hairs varies a lot (notice on Perle above some thicker patches of pencil lines near her withers, flank, and barrel). Experiment to find the right pencil – I use Derwents and pastel pencils, but there are lots of options out there and there is certainly no right answer. One brand I’ve heard good reviews of repeatedly, but never tried, is Prismacolor Verithin. I use Derwents mainly because that’s what I already had when I started doing models, and they work well for me. 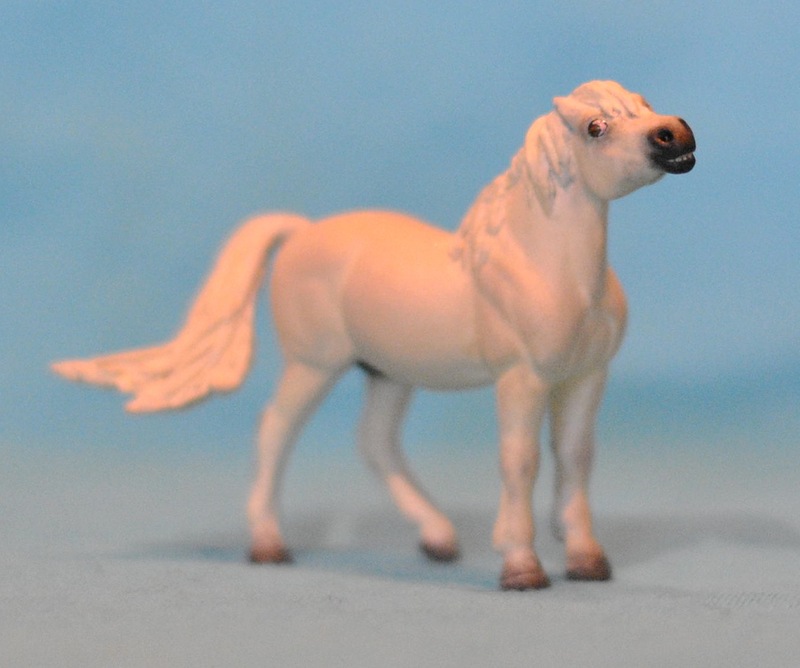 Earlier this week a member of the bakercustoms Yahoo group posted about using modge podge to seal Schleichs (and similar plastic ponies like Safari and Papo brands) in order to prevent the “tacky” surface that can happen with these customs. 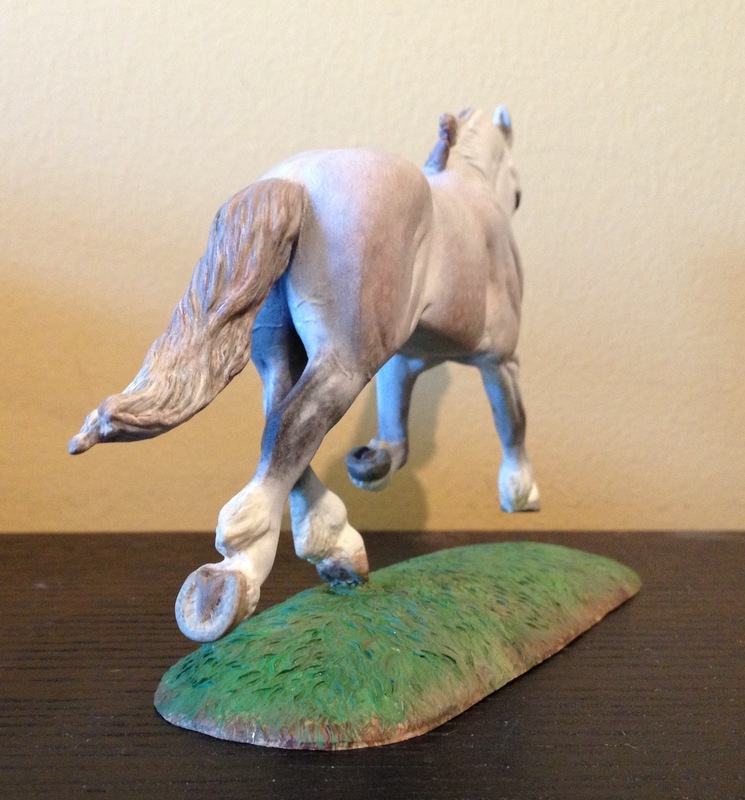 I just finished painting a Safari Lipizzaner, so I decided to try this technique and see how it went. Modge podge is basically watery glue sold under a brand name for crafting. I have heard that you can create it by just mixing Elmer’s white glue with water until you get the right consistency, but I can’t guarantee that would work with models the way the branded stuff does. You can buy modge podge at most craft or hobby stores. It’s great for sticking paper to plastic, glass, metal, etc. to create cool collages on bottles, boxes, or furniture. 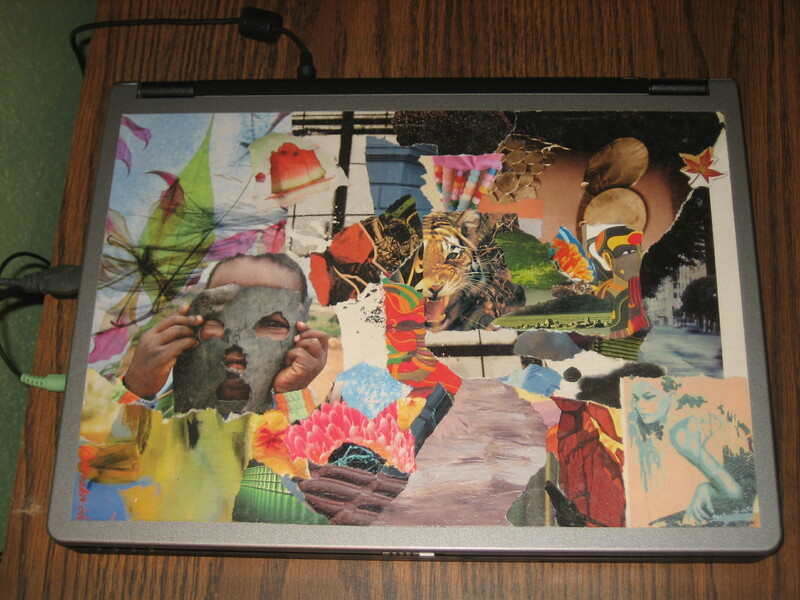 I've used modge podge many times before, for example to decorate my old laptop. I also have an awesome modge podged side table. It's a great craft product for all sorts of fun projects. Happily, I have modge podge in my craft box from all these past projects, so I was all prepped with what I needed to coat a model. The one thing about modge podge to watch out for is that it can kill your brushes, so don’t use an expensive brush or one that you love. What you want is a decently large (you want to thoroughly coat the whole model), pretty soft paint brush. I had one handy that probably came with a cheap water color set. Just use whatever you’ve got around, but wash it very thoroughly when you’re done. 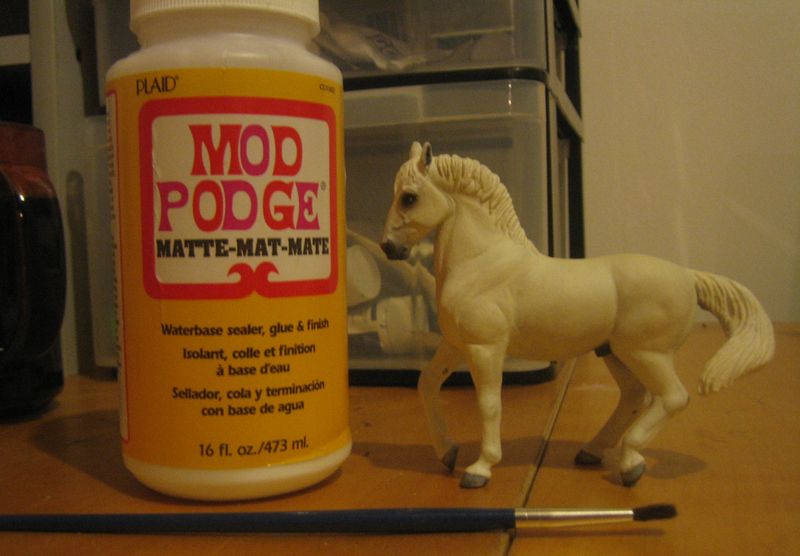 The tools: mod(ge) podge, brush, fully painted horse. You don’t need much modge podge to coat a horse, so you don’t need to buy a big vat like I do- I just love modge podge so I buy in quantity. My model has been fully painted and sealed with Dull Cote. He does not yet have glossed eyes, since the nail polish can turn milky if it has fixitive over it. Here he is with one layer of modge podge, looking very shiny. 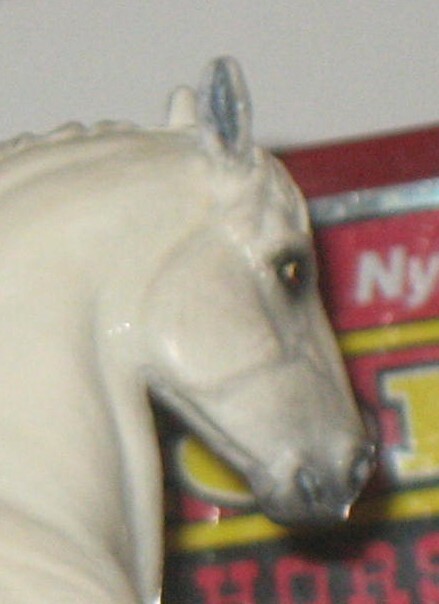 This (blurry) photo sort of shows the "milky" color that modge podge turns the horse before it dries- notice the light grey on the muzzle, which is in truth closer to black (compare below). Make sure you let the modge podge dry thoroughly between coats. I left it overnight just to be safe. When it is dry the horse has a interesting new feeling, sort of smooth and soft. He definitely feels very sealed, and I can believe that this prevents tackiness! After the modge podge layers were dry, I sealed him in two coats of matte spray. Although the modge podge bottle says “matte,” it really makes your models semi-glossy. Some customizers may like that but I prefer a flatter color, so I sealed him again. Painted, modge podged, and fixatived. He is done except for the glossed eyes. This picture is a little dark, but the color on his eyes and muzzle is closer to the real thing than in the above picture showing the milky coating of wet modge podge. 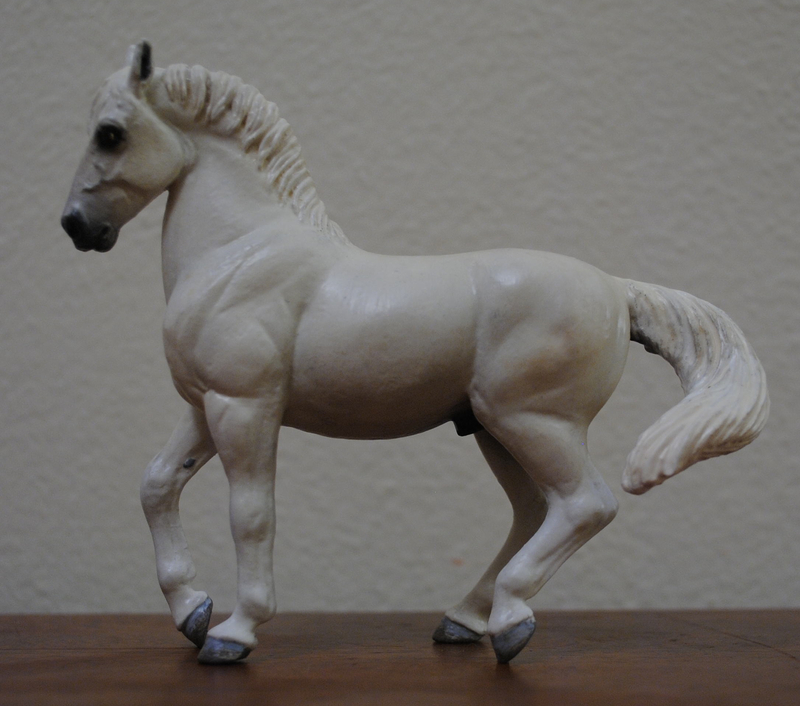 I’m very pleased with how he turned out, and confident that he won’t have an seepage problems like some Schleich and Safari horses. What I didn’t learn from this experiment is if sealing with modge podge can change the color or depth of a more colorful coat. 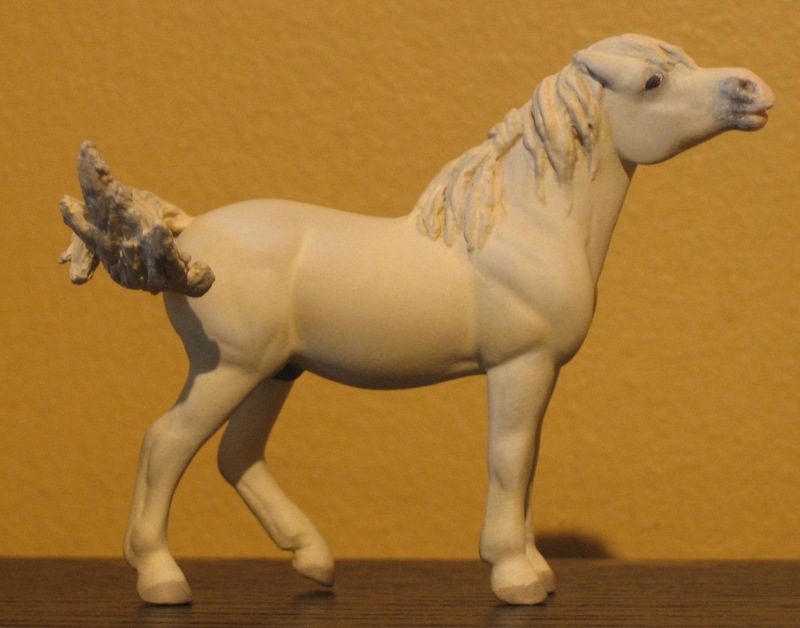 This model happened to be a white-grey, but that means that it’s harder to tell if the modge podge turned him a lighter color or retained any of it’s milkyness. In my experience with modge podge you can see the colors of the material very well, but this is new use of it so you never know. Has anyone else done this? Results? I look forward to trying it with my bay Safari foal once he’s done.